Most acknowledge that Microsoft Project is too difficult to use if all you want is a nice-looking Gantt chart. There are a number of low-cost alternatives to Microsoft Project. But all of them still try to be project management tools. Timios Gantt Designer is an exception. 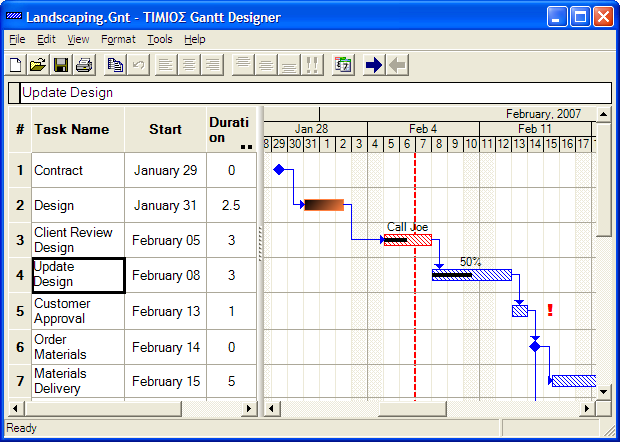 Gantt Designer is serious but easy-to-use and focussed solely on Gantt charting - project management is a by-product. Textual data are entered like in a spreadsheet. For data that can be graphically represented, eg start time or duration, you can use your mouse to drag and resize time-bars. Charting assistance with true calendaring. Specify the number of days required to complete a task and Gantt Designer will automatically take care of weekends and holidays. Updates automatically if you change the start date. Drag and drop to link tasks, with extensive checks on dependencies, and affected tasks will be automatically re-scheduled, visually and instantaneously. Links that are meaningless are prevented. Flexible printing options that are a breeze to set up. Spans large charts across multiple sheets with ease and like what you would expect. You can also print to a crisp image file for inclusion into web pages. Time-bar annotations linked to a task property. Copy and paste portions or whole chart into other Office documents with ease. Gantt Designer is fully Unicode-enabled for your data. Software is translated into German, Chinese, Italian, Spanish, French and Portugese.